If there is no sticker attached to the place you see after you open the cover of the Scanner, please contact the administrator of the device or the person who purchased the device. Please ask them to attach the sticker included in the ScanSnap iX500 Sansan Edition package according to the instructions in "Sansan Set-up Guide". If the Scanner you have is different than the Scanner in the picture above, you cannot use that scanner for business card scanning functions. Please use a Scanner that has the logo in the picture printed on it. (2) If the sticker attached to the place you see after you open the cover of the scanner is blank in the (a) and (b) areas. It is necessary to fill in the (a) area on the sticker you see when you open the cover of the Scanner. If (a) is not filled in, please check the back of the Scanner, and find the string of numbers and letters labeled "SSID". Copy the numbers and letters after the "iX500-" onto the (a) area of the sticker with a permanent marker, carefully noting the difference between capital letters and small letters. * Please be careful to not rub the ink on the sticker after writing, as it may bleed. (3) If the sticker attached to the place you see after you open the cover of the Scanner is blank in the (b) area. When the sticker attached to the place you see after you open the cover of the Scanner is blank in the (b) area and you are trying to use the scan function from the Sansan Smartphone Application, if the network written in (a) of the procedure for connecting the Sansan Application and the Scanner does not show up in the Wi-Fi setting screen, please use this procedure. Please ask the administrator of the device the following things. -To write the name of the network the Scanner is joined to in the (b) area of the sticker on the Scanner. 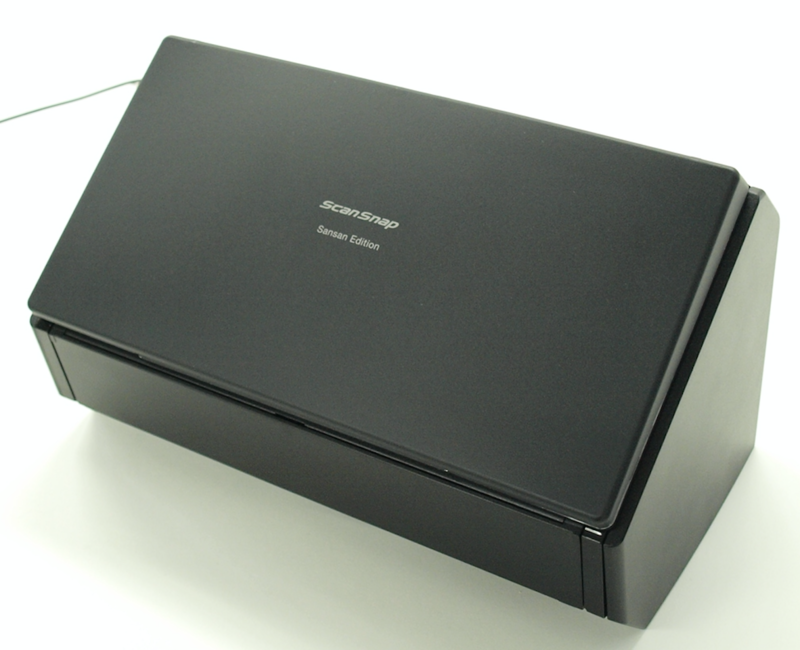 -If the access point of the Scanner is not known, to check the "Please read this first", a document included in the package for the ScanSnap iX500 Sansan Edition, and to reset the wireless LAN connection settings. After the settings are done, to write the name of the connected network in the (b) area of the sticker on the Scanner. (4) If the sticker attached to the place you see after you open the cover of the Scanner is filled in for both the (a) and (b) areas. The Scanner may not be correctly turned on. Please close the cover of the Scanner, and restart from the first step after tapping on "Scan with ScanSnap". In the procedure for connecting the Sansan Application and the Scanner, select the network written in the (b) area, and if the following screen comes up, it may be that the wrong Scanner number has been selected. 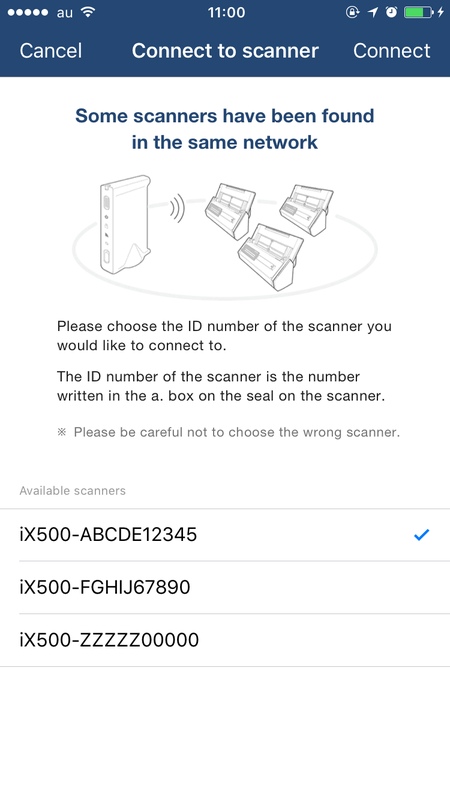 Select the Scanner number that is the same as the one in the (a) area, and then tap on "Connect". If you still cannot get a good connection, please see the back of the Scanner and check the alphanumeric string marked "SSID", after "iX500". If the string that appears in the (a) area is different than the SSID string, please input the string from the back of the Scanner into the (a) area .